I am really excited to be joining the team of bloggers at farmgraze. Before I share my experience with creating a family meal I would like to take a moment to introduce myself. I am a busy mother of wo living in Pittsburgh. I have a Ph. D. in Psychology but decided to actively lean out of the academic job market two years ago to focus on taking care of my kids and pursuing other passions (like writing). Cooking and family are two of my main pleasures in life and I strive to serve my family meals that are healthy and flavorful. Cooking for myself, my husband who is a physician, and my four-year-old while taking care of my 2 month old is definitely a challenge. But despite the mismatch between my kidss and husband’s schedules we try to make it a priority to sit down to a family meal every night. Coming together at the dinner table is a way for us to connect at the end of the day and to show our children that joy of making and eating real food. Cooking and serving real food rather than boxed or prepared has become even more of a priority since having my daughter because I want her to grow up understanding and appreciating the wide variety of delicious and healthy options in the world, and because she happens to have some food allergies that make many processed meals unsafe for our family. My meals are usually simple but I try to focus on using whole foods and lots of seasonable fruits and vegetables to ensure that we are getting food that is nutritious and appealing. To be honest, meals at our house have become a little formulaic lately because I have approximately 15 minutes each week to think about everything I want to make before running to the grocery store on Saturday mornings while my husband watches both children. But I try to make weekends a little more creative and hearty since I generally have extra help in the kitchen and with the kids. This past weekend my parents were visiting and the weather forecast was looking cold and colder so I decided to make soup. 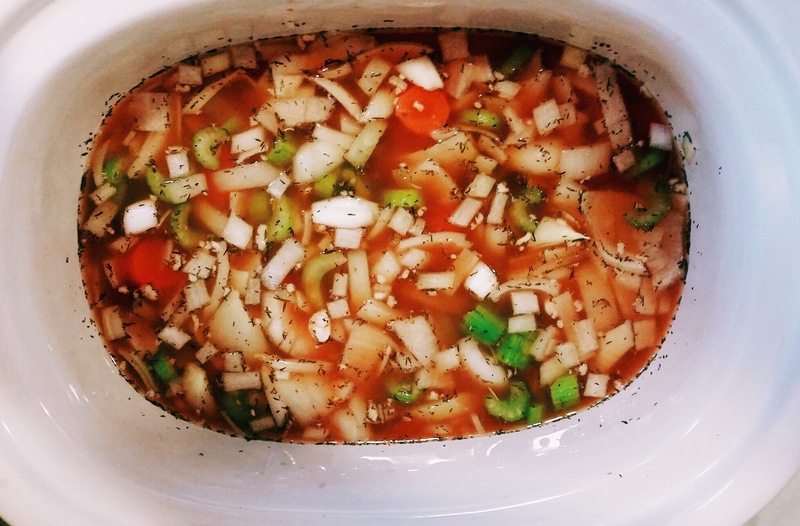 Usually when I make soup from scratch I just do it on the stovetop but I happened to have a slow cooker recipe book on me in the grocery store parking lot and so inspiration struck with the idea for a modified White Bean Tuscan crock-pot soup. Vegetable soups are becoming a staple in my house because between my preschooler’s preferred diet of donuts and fruit snacks, and my desire to lose the baby weight hanging around, we could all use a few extra servings of veggies and they are a great healthy comfort food. The recipe I wound up following was from a cookbook called Gourmet Slow Cooker and it’s quite simple. You start with a pound of white beans and either soak them overnight in cold water or soak them in hot water for 2 hours, I chose the latter since I was not organized enough to prep the night before. Then you put the beans in a slow cooker and cover them with water. You add what I consider to be the soup staples, a carrot, some celery, and onion, and a few heads of garlic all nicely chopped. Throw in a small can of crushed tomatoes and some thyme and let it all cook for 6-8 hours on low. After the soup had cooked for about 5 hours I snuck into the kitchen and sampled a bit and I was a little disappointed in the lack of flavor so I quickly tossed a healthy heap of salt and pepper into the mix for the last hour. However all my reservations about the flavor were misguided because as I plated each serving I also added a drizzle of olive oil to the bowl and some grated Parmesan cheese (or nutritional yeast for my daughter who can’t have cheese). 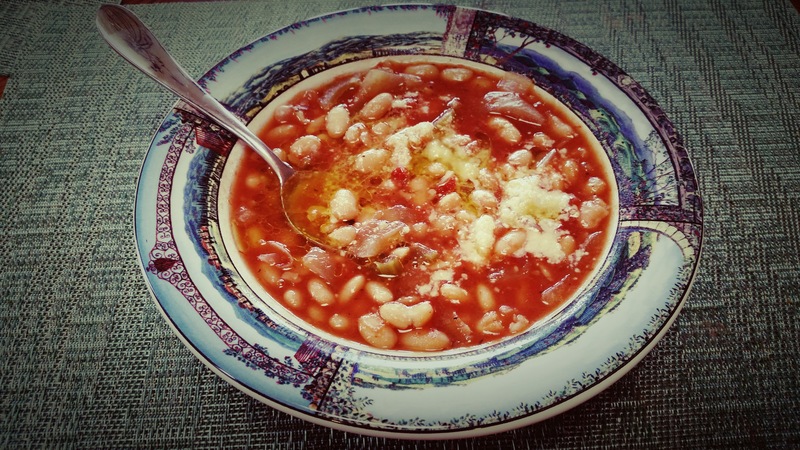 The flavors of the beans and vegetables paired with the oil and cheese was phenomenal. We topped of the meal with some biscuits, whenever I make soup I always make biscuits because personally I think biscuits are pretty much little balls of heaven and I like to throw my daughter a bone and make at least one thing she loves with each meal. The soup was a hit with my crew. My daughter gobbled up her biscuits and dipped them in the soup remarking that she loved the broth. Eventually I got her to try the vegetables too and she said the beans and the onions were her favorites. My husband loved it and had seconds. I was able to eat one-handed while nursing the baby and I still have plenty of leftovers for lunch this week. Not too bad for about 30 minutes of work on a frigid Monday morning.